Arisia is tired of her life and her horrible relationship, so she does what any smart woman in this future would do--she arranges her own kidnapping. It's the perfect crime, until it's clear that something's not quite right on her rescue ship and that her boyfriend just won't let go. As things spiral out of control, Arisia finds herself between the rock of her ex and a very hard(ware) place in a clever short story by this husband and wife team. The thing that I liked about this one when I was paging through it at a show is the way that it plays with traditional narratives. We're very used to the kidnapping trope, but using it as a ruse to escape a crappy boyfriend in a backwater part of the galaxy is really clever. But when we get to the ship, and the art and dialogue start giving clues that things aren't quite right, the mini goes from being interesting to one I call attention to in a review. 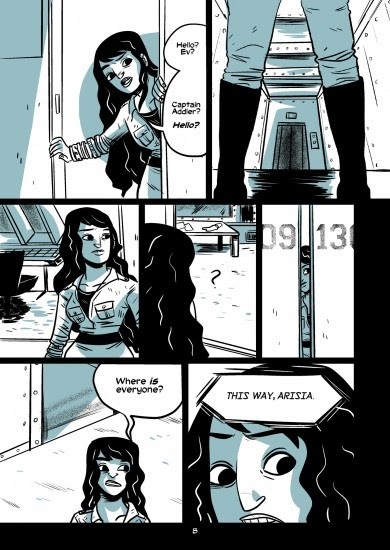 Through extensive exploration of the ship, Arisia slowly comes to smell a rat--or rather the lack of rats, as the ship has no human crew whatsoever. Just as she's coming to grips with what this means, her ex shows up, complicating matters. That distraction is just enough keep the reader off balance as we reach the climax, where we learn that Arisia may have exchanged one prison for another. An opening line of "It's this...or death" gets a nice echo in an ending that can be read as either hopeful or hopeless, depending on your perspective. Tara Abbamondi's art, owing quite a bit to the powerful cartooning triumvirate of Faith Erin Hicks, Hope Larsen, and Bryan Lee O'Malley, tells the story with just enough going on keep it interesting, but there's not a lot of innovation. She sets the space stage just enough to give the story grounding,but sci fi fans looking for intricate details on the ship will leave disappointed. Most are standard backgrounds of ship walls, thanks to an extensive use of close-ups on Arisia and her reactions to the situation. The art focuses mostly on Arisia, whether smiling, scowling, or investigating. To one degree, since the story is about her, this works. On the other hand, Ms. Abbamondi's range isn't quite strong enough at this point to make them varied enough. We see similar looks a bit too often, and the emotions of the character don't come through as much as they need to for this story to work as well as it could have. What we get isn't bad--there's definite skill and care taken to tell the story clearly--but between the plain backgrounds and similar takes on Arisia's body language and posing, this one falls more on its plot and script than art to be worth reading. 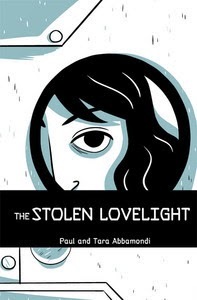 I liked Stolen Lovelight because of its premise, and it's not as though the art is terrible. The Abbamondis definitely have a lot of promise, once they branch out a bit and experiment more. That will come in time, especially as the art refines and changes away from its influences. It's definitely worth a look if you like the look of the visuals, and you can purchase it online here.